I was surprised and delighted to get a review copy of this book in the mail this week from Houghton Mifflin Harcourt. I enjoy Bill Thompson III's blog, podcast, and his magazine and I had read about his new book. I didn't know HMH was sending me one, and I'm sure glad they did. 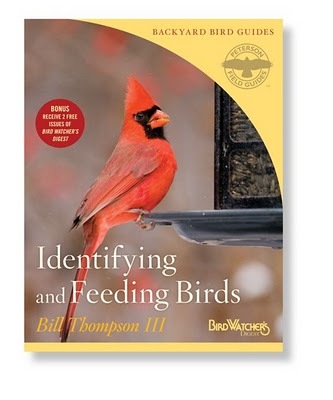 Bill states that the purpose of writing this book is so that we backyard birdwatchers "attract and enjoy more birds" and therefore "have more fun". He points out that feeding wild birds is "done more for us than for the birds", and because we do it for our own pleasure, "we owe it to the birds to do it right". This book is now the Bible of Backyard Birding, giving fantastic instruction on bird baths, feeders, nest boxes, seed and landscaping. Sure, you could probably find all these same tips scattered across the world wide web, but to have them so succinctly in one place along with Bill's charming personality makes this book special. When I first got this book, my greatest desire was to know which native plant species are best for birds so that I can plan for my future birding oasis. I was delighted to find that chart on pages 55 through 57. He provides some good reasoning to deal with neighbors who question your intentionally "rough around the edges" landscaping. Now if he'll just pay the fines from the Home Owner's Association for me! (Just kidding. I actually live in a great area with wild landscapes right out my back door.) I also really like the chart on page 27 which shows several types of birds and what they like to eat. Very helpful! The last section of the book is similar to a field guide, displaying pictures and info about most of the birds you might see in or near your backyard. I thought it was funny to read Bill's comments on GFCI protected outlets, almost like they were some foreign object. I guess as a home builder I am very familiar with them and have not lived in a home without them. If you think you knew all there is to know about backyard birding, please enjoy this book and learn some more! I did.